NEW YORK (CNS) — In the rapidly expanding, increasingly menacing world of cybercrime, hackers bent on fomenting chaos are known as blackhats. Beyond demonstrating their own skills, their primary goal tends to be sowing disruption rather than, say, triggering a financial windfall or highlighting a particular cause or ideology. 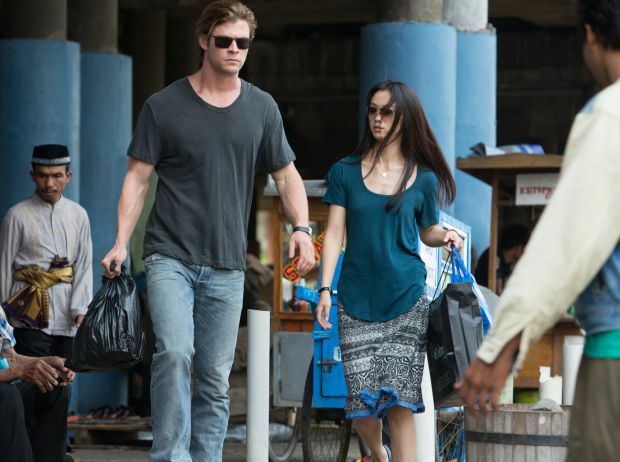 Nicholas Hathaway (Chris Hemsworth), the protagonist of the topical thriller “Blackhat” (Universal), is one such coder. His ability to discern the motivations of the anonymous hacker who functions as the movie’s villain — and who would be dubbed the “black hat” in a traditional Western — is the key to the plot and to Hathaway’s truncated journey toward redemption. Bona fide heroes are hard to come by in director Michael Mann’s films. He has built his career on creating stylish, moody crime portraits in which precious little separates the good guys from the bad. Mann frequently evokes a shaded moral atmosphere using arresting lighting and a rich palette. Nothing is purely white or black. Because his aesthetic suits this picture’s subject matter, themes and Pacific Rim locations, there’s good reason to expect an original movie, or at least one that makes computing and engaging in digital terrorism seem like innately dynamic activities. “Blackhat” does not disappoint insofar as it has visual energy — a look and flow that are simultaneously kinetic and lyrical — underscored by eerily pulsating electronic music. Yet in the end it’s a standard action picture that glorifies physical aggression and unintentionally proves that hacking is far from a novel or elevated form of criminality. The good news is that the movie is free of grossly offensive elements. By not including disturbing images of gore, streams of vulgar language or scenes of low carnality, Mann and company tweak the current action formula to a small but welcome degree. “Blackhat” opens with a lethal cyberattack on a Chinese nuclear power plant. When the United States warily agrees to assist in the investigation, China’s leading computer forensics expert, Capt. Chen Dawai (Wang Leehom), insists on consulting Hathaway, his friend and former roommate at MIT. Hathaway, who is serving time in federal prison, wrote the original malware used in the attack. He signs on to help track the perpetrator on condition that his own sentence will be commuted if his efforts succeed. Chen’s sister, Lien (Tang Wei), a comely network engineer, joins the team of cybersleuths, as does FBI agent Carol Barrett (Viola Davis) and the U.S. Marshal assigned to keep tabs on Hathaway. After their quarry hacks into the commodities markets to manipulate the price of soy, they travel to Los Angeles, Hong Kong, Malaysia and Jakarta. The programmer’s thuggish accomplice Kassar (Ritchie Coster) inflicts significant damage at various points. And a romance between Lien and Hathaway quickly flowers. Putting his hacker instincts to positive use, Hathaway exhibits many noble qualities. His virtuousness has its limits, however, since he ultimately engages in vengeful violence. Strapping Australian actor Hemsworth (of the superhero franchises “Thor” and “The Avengers”) acquits himself fairly well, though permanently deleting the stereotypical image of computer whizzes as scrawny and cerebral proves, as it were, a herculean task. Squinting to signal intense cogitation or furiously pecking on terminal keyboards during eureka moments certainly won’t suffice. In Hemsworth’s defense, screenwriter Morgan Davis Foehl provides minimal dialogue and exposition. On a granular level, the script has an elliptical quality, whereas the broad strokes make sense — though only until the storyline short circuits three-quarters of the way through, which might explain the subsequent reliance on violent action cliches. Along with their decision not to weigh “Blackhat” down with objectionable material, Mann and his collaborators also deserve credit for assuming moviegoers are intelligent enough not to need everything spelled out for them. Nevertheless, style and restraint can only mask a fundamental lack of substance for so long. The film contains considerable, moderately graphic, action violence, a mostly implied premarital sexual relationship and some crass language. The Catholic News Service classification is A-III — adults. The Motion Picture Association of America rating is R — restricted. Under 17 requires accompanying parent or adult guardian.